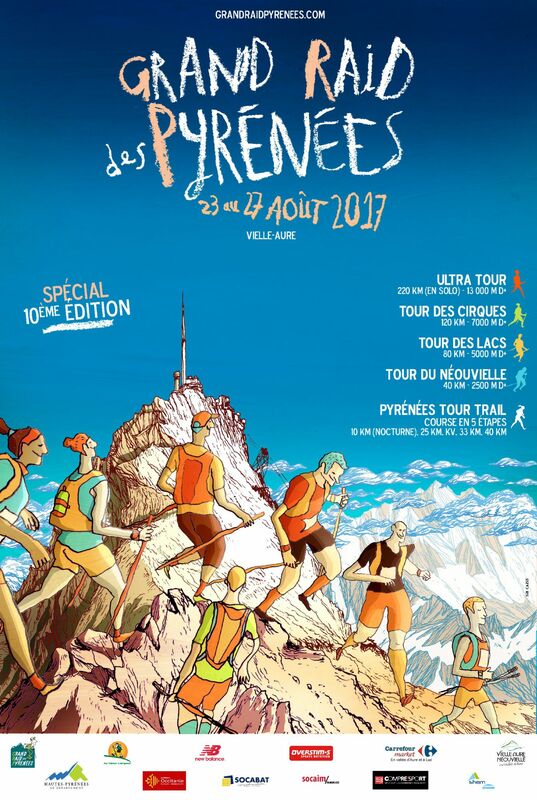 Given the number of pre-entries on the various races, only the Pyrenees Trail Tour could have been drawn. So we decided to increase the number of bibs by taking on the bibs ‘organization’ in order to allow everyone to validate his pre-registration. The payment will be opened from Thursday, December 22, 2016 (8:00 am) until January 8, 2017. After this date, pre-entries that have not been validated will be canceled and the corresponding places will be returned to the quota of places still available. For trailers who have not been able to pre-register, they can register according to the remaining available seats according to the races. Full regulations are available HERE (current version). The medical certificate model is HERE. 200 participants for the Pyrenees Tour Trail. – Entries will be made only through the website of the race. No registration by mail, phone or paper will be recorded. – Opening of pre-registration on the race site on 14 December 2016. Pre-registration for the race will be possible until Wednesday 21 December 2016 at 20:00 (payment will be made after the draw If necessary). During this period, each person will be able to pre-register through the on-line registration system. Each person must make only one pre-registration. In the event of multiple pre-registration, all pre-entries will be removed from the list before the draw. – On 22 December 2016, draw (if necessary) on each race from the list of valid pre-registrations according to the conditions of the regulation. If it is not necessary to make a draw, open the payment the same day. If draw, publication of results on 25 December. Persons drawn on the waiting list may be called in the event of withdrawal from the main list. – From December 26, 2016 to January 8, 2017 at 8:00 pm, opening of online payments, so that each person who has been drawn on the main list can validate his pre-registration by making the payment. Payment will be possible until 8 January 20:00. Persons who have not made their payment to validate their registration during this period, will see their pre-registration permanently deleted. – From this moment (and always if there is a draw), the persons on waiting list will be switched to the main list, according to the number of places still available. These persons will then be authorized to make their payment to validate their pre-registration. Payment will be possible until January 15 at noon. Following, a new sequence will be reproduced in order to integrate on the main list the following ones of the waiting list of each of the races, according to the places still remaining. These iterations will end when all the places are allocated, when the waiting list is empty or at the latest on June 30th midnight, final closing time of the registrations. No information will be sent to individuals individually to keep them informed or to inform them about the progress of the registration process. The information will be posted on the race website under registration, and it is up to each person to be informed by visiting the site. For group registrations, in order to ensure the participation of the whole group in the event of a random draw, each rider must make his / her individual registration and at the time of it, define, if he wishes to enroll in a group, the name of its group in the field reserved for this use. 2 – In the box below, carry the chosen name with ABSOLUTELY the same syntax for all the members. In the draw, all members of the same group will be assigned the same order number. So in case of drawing of this number, all the members of the group will get a place. A group may consist of up to 10 riders. These entries are made online via the website of the Organization and are validated when payment of the entry fee has been made. The rider also undertakes to provide the medical certificate as indicated above, before 20 July 2017. The rider who has not provided his medical certificate by 20 July 2017 at the latest will be charged 20 euros At the time of the withdrawal of his number (in cash). For foreign riders, the use of the model medical certificate provided by the Organization on the website is mandatory. No acknowledgment of receipt is sent, each registrant can check his registration on the site. People registering in one of the 5 races can not change their registration to switch from one race to another. It is firm and definitive. It is not possible to exchange his bib with another rider registered on the other racing version or not registered for the race. Until June 30, 2017, any request for cancellation will be taken into account according to the conditions of the reimbursement below, from the moment it is in conformity with the regulation (request sent by registered mail). Starting July 1st 50%* Amount of the refund rounded up to the euroBeyond 10 August 2017, no cancellation request will be processed. Refunds shall be made at the latest within two months of the event.